The most important is to start. So don't think too much. Get a pencil, some paper and let's get started. Draw a rectangle on the bottom page and write down your name, surname and your date of birth into it. Then, draw another two rectanegles above it and write down the full names of your parents and their dates of birth. Add another rectangles with the names of your brothers and sisters. And the successfull beginning is done. Don't draw too complicated family tree on one piece of paper, because you will get confused. 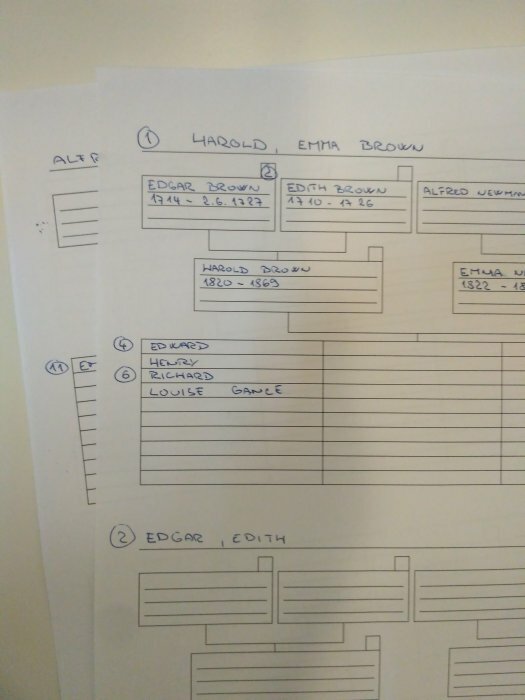 For example, if you want to make your brother's family tree, use another piece of paper. Label the first piece of paper by number one, and another one label by number two. On the first piece of paper write down number two above the name of your brother to find all information about your brother on a piece of paper labeled by number two. If you have a sister, too, put number three above her name (on the first piece of paper). It means, you will find all the information about your sister's family tree on the piece of paper labeled by number three at the top of the piece of paper. Do the some with all your members of your family. If you have let's say a mother, a father, one brother and one sister, then you will have one of piece of paper with the names of all memebers of your family and five other pieces of paper with details of separate members of your family. To save your time with drawing the rectangles, this link www.facestree.com/zostavy/skicar.pdf can help you. If you know personal details of your relatives by heart, you can immediately write them down. If you are not absolutly sure, it's better to check them.